Our company has been in the European market for 20 years. It is located in the most prosperous and rapidly developing region of Poland - in the Upper Silesia. Our activities focus mainly on manufacturing polycarbonate skylights, especially barrel vaults installed within aluminum profiles, as well as very durable polycarbonate awnings, shelters and car sheds. 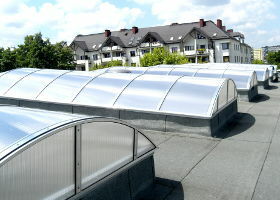 The professionals from our company also perform construction works necessary for skylight refurbishment. Their activities usually involve the replacement of old glass skylights with new polycarbonate and aluminum barrel vault skylights. 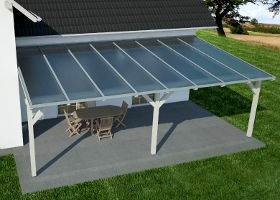 Our activities also include the sale of PC sheets and accessories needed for different types of skylights and polycarbonate skylight roofing for big and medium-sized buildings. Both in Poland, as well as abroad in neighboring countries, we also carry out the installation of our skylight constructions. The majority of our materials are sent, both to our regular customers as well as to new ones, in the form of semi-finished products ready for installation - all the works can easily be performed by the customers themselves. All aluminum profiles used by our company are of our own design and have been registered in the Polish Patent Office. 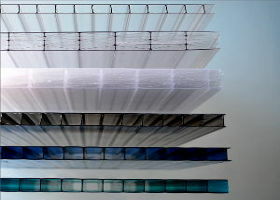 The main idea behind our products is to prepare the materials for the customer in such a way, that the skylight installation will require possibly the lowest amount of effort. That is why we avoid unnecessarily complicated constructions and favor simple and well‑proven solutions. We are aware that every object wears out with time and we make every effort to assure that any necessary refurbishment of our skylights will be as distant in the future, as easy to perform and as cheap as possible. We invite you to send us offer questions. Please attach any photos, sketches, plans or blueprints - the more information we get from you, the more accurate our proposal will be. If, for example, you wish to replace an old skylight with a new polycarbonate one, we need very detailed photos of your roof (shooting a short film is also welcome!) If you wish to paint the metal elements of our construction, please indicate the RAL catalogue color. We will do our best to make you surprised at the reasonable price and highest quality of our skylights. Our proposals usually include ready-made materials or semi-finished goods but if you wish to have the skylight installed by our experts, we will also include the cost of installation in our offer. The menu on our website includes a lot of useful information in the form that is very easily accessible for our visitors: detailed visualizations and cross sections or short films. If necessary, we are ready to present more detailed drawings and plans of the solutions that our company can offer. Do not forget to visit the gallery on our website - the photos present only a part of our sample project realizations.